The apparent simplicity of the 85,000 square-foot volume belies the extreme complexity of its program. 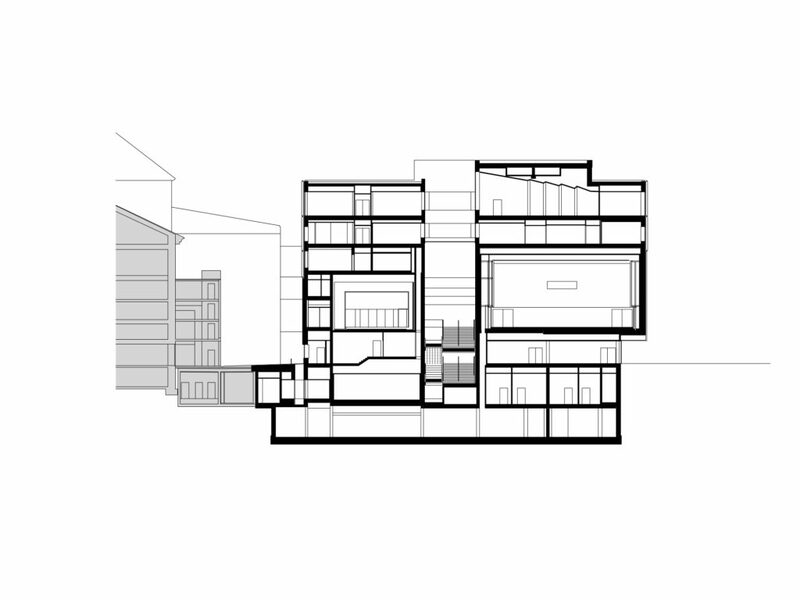 The building is immersed in its privileged setting, where it is scaled to complement neighbors and offer generous views and reflections. Its transparent base and great open spaces blur interior-exterior distinctions so that the outdoors visually flow inside while the building’s interior functions — clearly organized for high visibility — pour out to the street in a multi-story landscape that engages even passers-by. 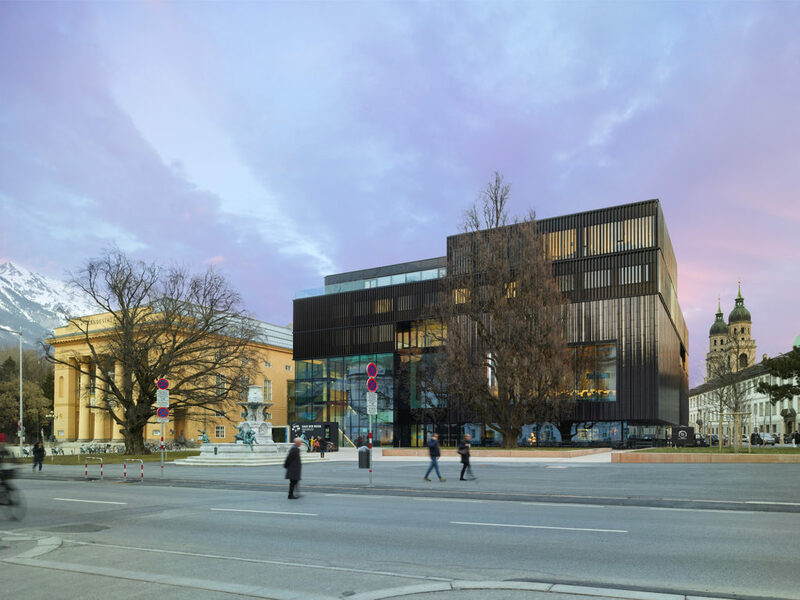 The large concert hall, with its sweeping glass façade, becomes a great plein air stage and the building’s entry plaza becomes a welcoming auditorium. 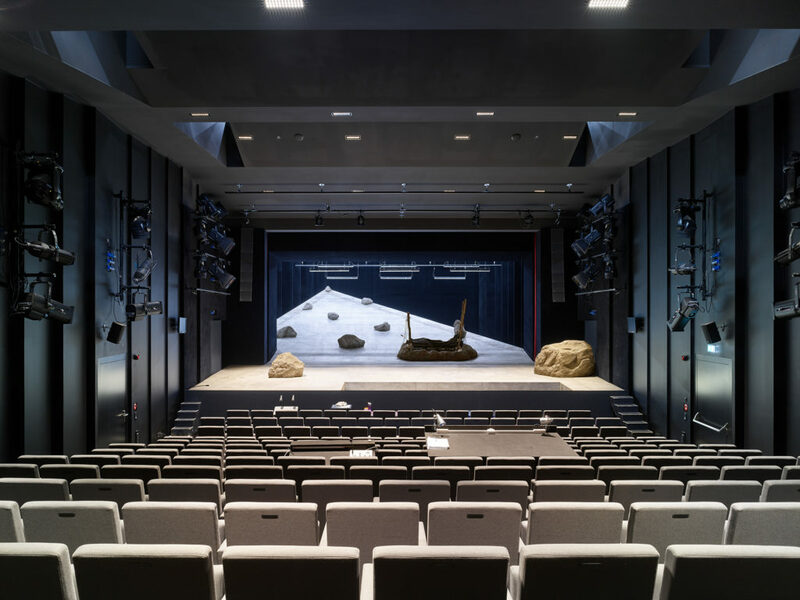 Designed to put its activities on display, the building reaches out to a larger audience than those attending performances. 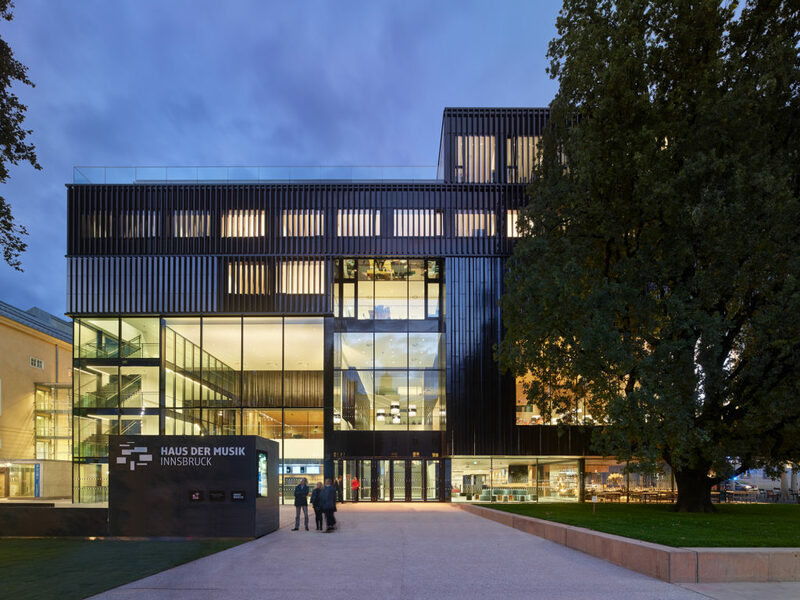 The defining openness of the House of Music is dramatized by the contrast of light and dark, transparency against the opacity of its glazed ceramic cladding. Changing light conditions by day and night animate the facade. 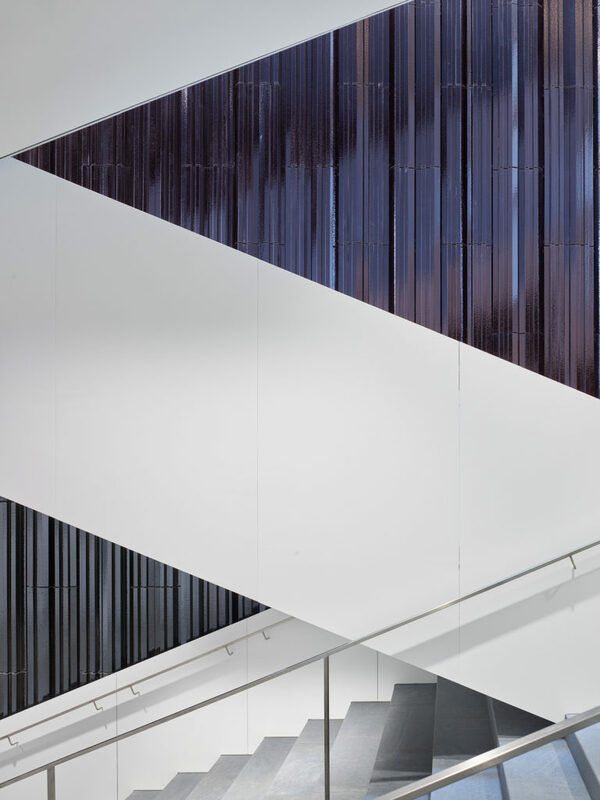 Depending on the weather and time of day, the extruded panels reveal a complex linear pattern derived from a rhythmic musical construct of quarter-note triplets. The glazing reflects sunlight with iridescent colors that shimmer from black to light brown. Transparent surfaces are treated with a similar ceramic lamella for continuity, shading and sun protection. 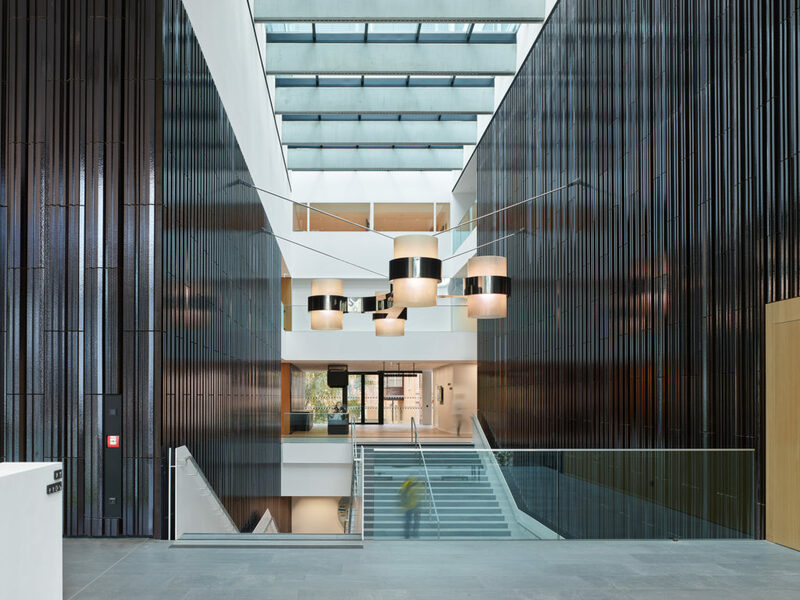 The interior is organized around a full-height lobby whose skylight fills the center of the building with natural light. Visitors ascend to the performance venues on monumental stairs equipped with spacious landings to invite social interaction. 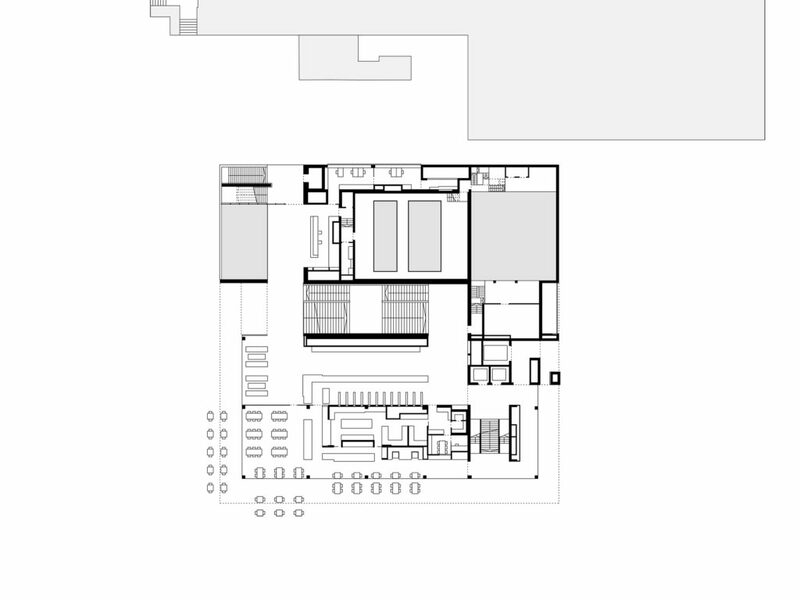 This is the public core, the open center of circulation, wayfinding and orientation. 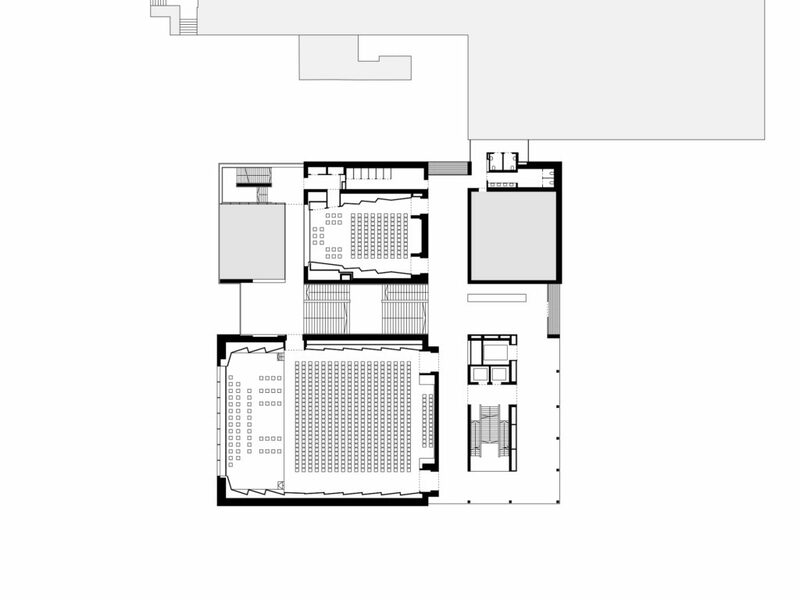 (Two additional stairs elsewhere in the building facilitate easy movement throughout; direct access to the Landestheater is provided on the north). 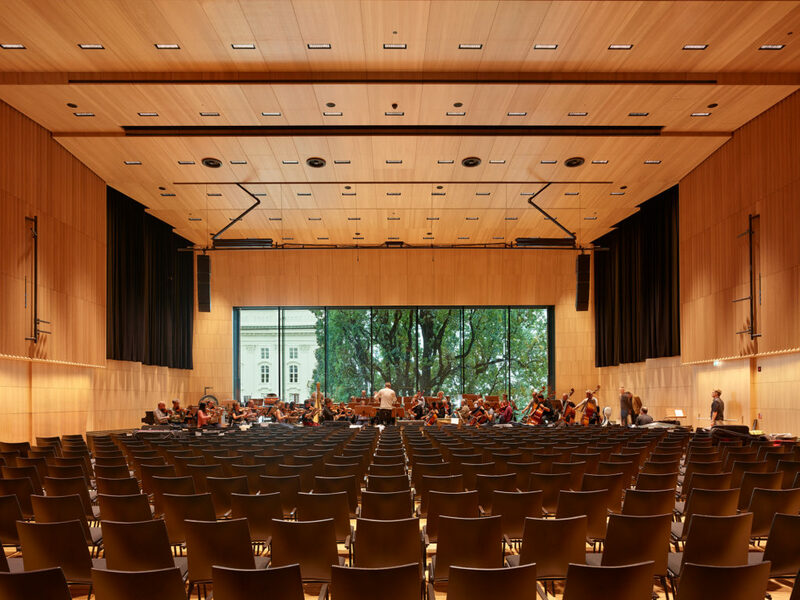 Ceramic panels line the outer walls of the concert halls but for acoustical reasons and ambiance, the interior of the large hall is faced in warm woods and the smaller is covered in a sensuous black velvet-like material. For sound and vibration isolation, each uses hermetic box-in-box construction. 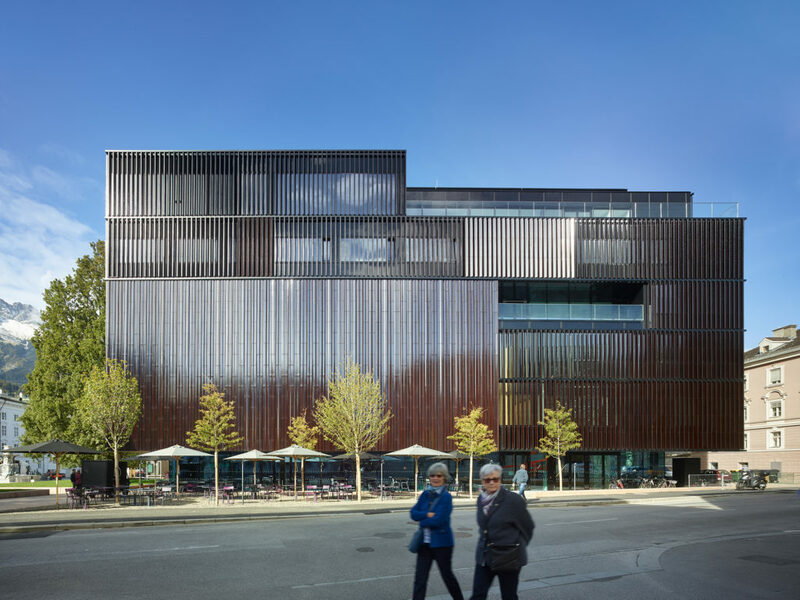 The building culminates on the top floor with the public library and outdoor viewing terraces that tie this connective project to its greater context. 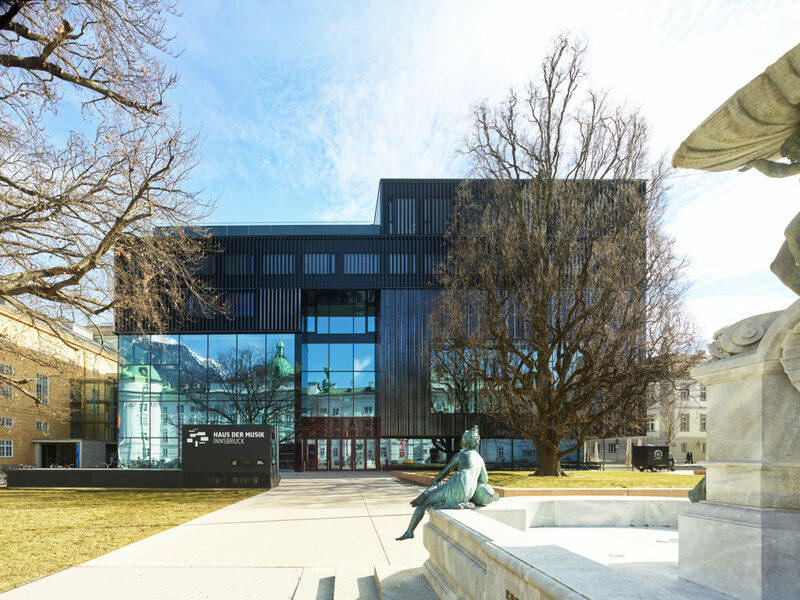 Strengthening Innsbruck’s musical heritage, which has long played an important role in Austria, this state-of-the-art building links the historic past to the future as it integrates daily life seamlessly with both popular and high culture. We developed the acoustic concept together with Müller-BBM, Munich. 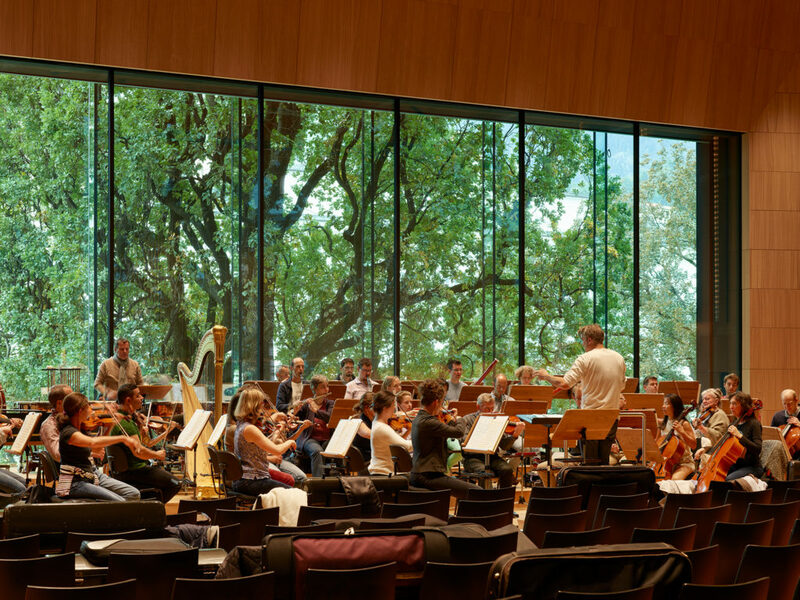 The result is an excellent acoustic setting, based on a massive room-in-room design for the concert halls. 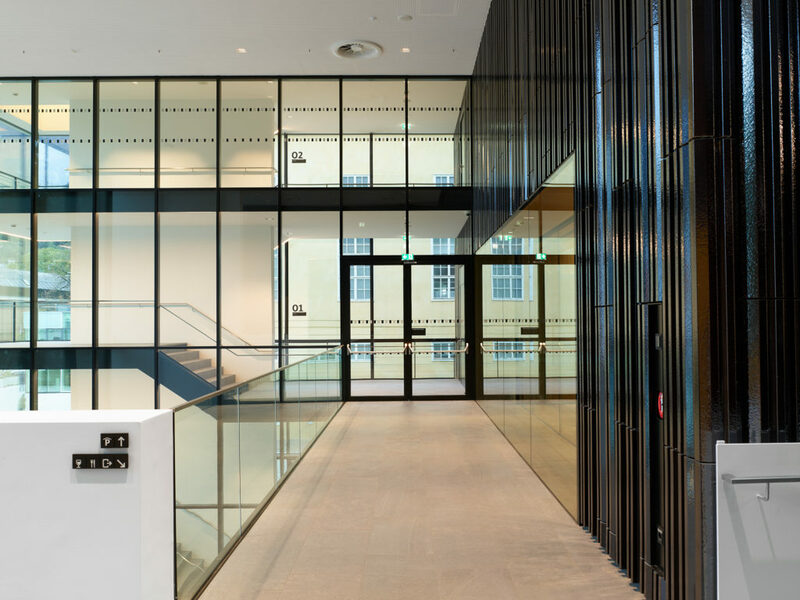 The ceiling as well as the limestone facing shells in steel profile framework were clad with specially structured wooden elements to ensure an optimum listening experience. The Great Hall with an acoustically effective volume of approx. V = 4,000 m3, achieves an excellent reverberation time of approx. Tsetpoint = 1.8 s in the medium frequency range (500 and 1000 Hz) for a seating capacity of 500 persons at soloist concerts. 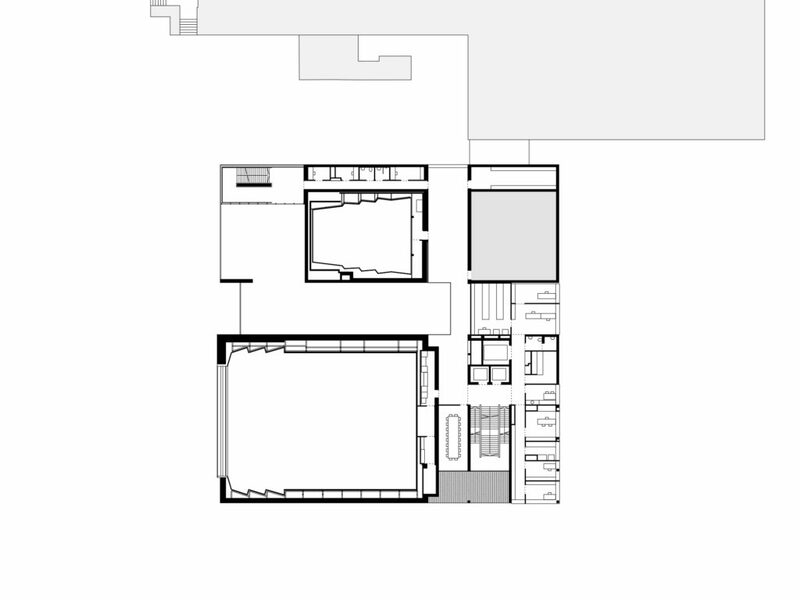 In the rehearsal rooms, the partition walls run at an angle to avoid flutter echoes.